In the last review, we at the lab enjoyed a nice Pear soda from a Russian town which is home to research in experimental mineralology and "physiologically active substances". The Weirdness potential of such a beverage is nearly off the scale*. 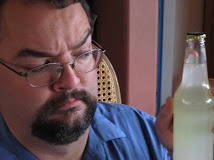 What we got was a pleasant but not extremely Weird pear soda, which was nice. However, I expect more from crazed Russian scientists. I want a soda left over from Soviet-era research, which will turn me into some sort of hideous human-bear cyborg hybrid with tank treads, adamantium armor, and plasma-arc flamethrowers emerging from my shoulders, filled with a compulsion to roll into Washington DC and claim it in the name of the proletariat. Or something like that. Well, here's another chance. From the same market, we also obtained a bottle of Napitki iz Chernogolovki ("Drinks from Chernogolovka", the aforementioned Russian research-oriented town) Cream Soda. The label depicts a glass of an amber beverage, along with a still-life-like raised plate with three spherical...objects. Perhaps rice balls or Sno-Cone components. One of them has an umbrella sticking out of it. Chernogolovkian Cream Soda. 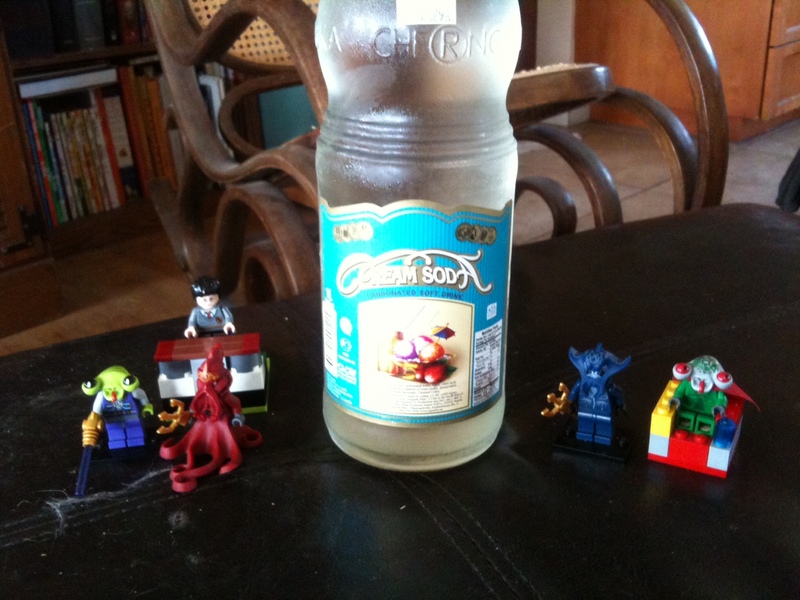 Hideous squid-man, manta-man, and alien overlords (and Harry Potter) provided in an attempt to elicit transformative Weirdness powers from the soda. Well, I suppose I could settle for being turned into a hideous human-rice ball cyborg hybrid, with...er...syrup-based armor...and umbrella-shaped flamethrowers...at a seaside resort? Oh, heck. It's cream soda. It'll probably be good. Scent: To my surprise, this has a scent closer to the bourbon vanilla extract family, rather than the sweet French vanilla. A fair amount of bite in the scent, and a hint of complexity. Promising! Taste: Quite a bit more tart than I expected. The initial taste is almost citrusy, but it fades after a few seconds into a well-balanced cream, sweet, and tart mix. The taste is more French vanilla than bourbon, but it's a nice example of type. The tart is now fading, leaving surprisingly little aftertaste. A second taste gives me an odd moment of metallic taste just when the initial tart is changing to the sweet, but it fades fast. Not sure what that was. It's a fairly nice cream soda, especially for the sweet type (I have a preference for the slightly ore bitter variety). The aftertaste is a bit more tart this time, but not too bad. I've been fairly impressed with the Napitki iz Chernogolovki drinks so far. I do have one more in the wings, which should prove interesting. And speaking of wings...aw, crud. No biomechanical appendages have sprouted from my shoulders. Not a hint of laser cannons in my forearms or palms. I see not augmented targeting overlay in my vision. How disappointing. Quaff rating: 3.5. A surprisingly good cream soda. Cough rating: 0.5. The tart aftertaste is still growing, and getting a bit less pleasant. In the world of Weird Soda, there is an interesting dim, dusty corner--the Sodas Which Dare Not Speak Their Names. These are the ones whose names are neither descriptive nor--at least to the provincial rubes such as myself--well-known enough to need no description. (Coca-Cola, for example, is familiar enough that I don't need to speculate on its taste). The other day*, while investigating an international market in Vista, I came across just such a coy bottle. It identified itself as "Duchess". 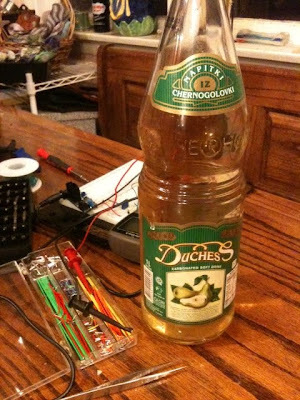 The possibility of a Duchess-flavored soda being too tantalizing to be realistic, I had to investigate further. This one, however, doesn't play too hard-to-get. Beneath the "Duchess" appelation is a picture of pears. Duchess here at the lab. Ultrafine tweezers, breadboard, and multimeter added for scientific credibility. Er. Yes. Duchess. Anyway, pears. Good. Well, this might be nice. I should further note that there is additional text on the bottle, but alas, it is unintelligibe to me. High on the bottle is a label which bears the inscription "Napitki IZ Chernogolovki", which seems Slavic. Come, let us consult the Google. I put in the text and request an Armenian to English translation. Okay...let's try Russian to English. No luck again...but interestingly, it makes a suggestion. "Did you mean Напитки ИЗ Черноголовки?" Um...I'm not sure. Did I? Sure. Well, that seems like a likely possibility. And lo, further investigation reveals that Chernogolovka is, in fact, a small Russian town not far from Moscow. Which--ah, what joy!--is a major center of Russian science, and houses research institutes in chemistry, physics, "physiologically active compounds", and experimental mineralogy. Wikipedia also confirms that this town is home to several beverage manufacturers, including Napitki iz Chernogolovki. Color: Pale yellow. Maybe slightly oily-looking? Scent: Hmmm. Maybe slightly pear-ish, but floral more than anything. A very sweet scent, like gum, with a pleasant fruity note. Taste: Surprisingly complex. Here's what happens: We begin with a cool, ever-so-slightly minty smooth flowerish sweet flavor. Pearlike flavors are present, but competing with a strong sugary tone. Slightly heady, oddly liquorlike feeling. This is followed by the development of some acidity, which actually makes it more pearlike. The acidity fades, and there is finally a sense of fruit and flowers, with a strong candy-like feeling. It's sort of the soda version of a pear Jolly Rancher. Quaff rating: 3.5. Pleasant and pearlike. Cough rating: 0.5. The acidity is undesirable. * A phrase which here means "a day which is not the current day", and can refer to any day or days within the last two years. The common usage of the phrase to refer to a day within the last few days is far too limiting. **Sort of like Bertie Bott's Every-Flavor Beverage, or something. "Argh! Jalapeno!"